It’s often interesting to hear how educators got started with blogging. Some people are told to blog. Others are encouraged by colleagues or inspired by seeing what other classes are doing. Then there are the school trailblazers who don’t know much about blogging but decide to jump in and learn as they go. Some educators have an interest in trying blogging so they investigate what platform they should use. Others are presented with a platform and they try it out because they can. This was my experience. My personal blogging story began back in 2008 in my fifth year of teaching. I was teaching a grade three class in Geelong, Australia. Always having had some interest in technology, I applied for a grant through our state Department of Education to have some time out of the classroom to learn more about technology integration. This opportunity transformed my teaching career. What a luxury to have time to visit, explore, play and share! I used one of my ‘Teacher Professional Leave’ days to visit the eLearning unit at the Education Department in Melbourne. Staff members showed me various tools and introduced me to our state’s CampusPress platform called Global2. Global2 is one of the largest and longest running CampusPress networks. It serves teachers and students in Victorian Government and Catholic schools. Educators are free to set up blogs for themselves, their classes and their students. Back to 2008. I didn’t know much about blogging but was open to new ideas so I happily set up a educator blog to share all the tools and resources I was discovering as part of my Teacher Professional Leave project. I cringe to look at the quality of my first blog now but we all start somewhere! 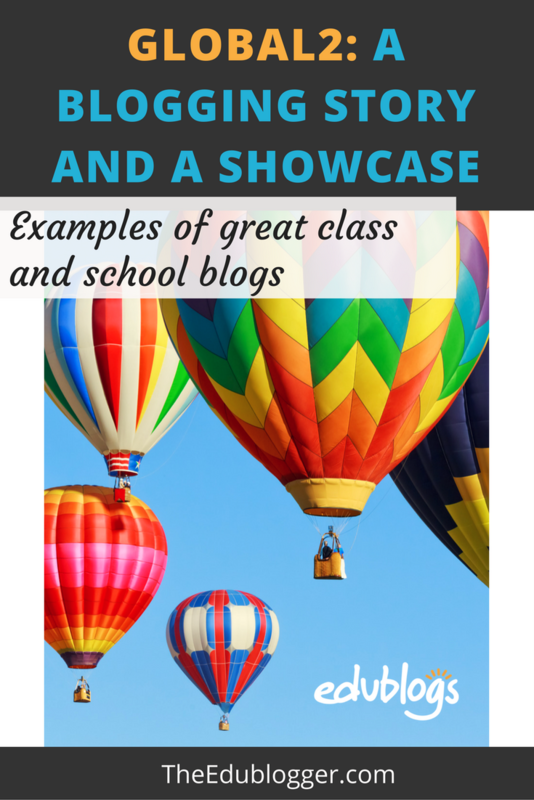 Having set up a teacher blog, I was also keen to introduce my class to blogging. I didn’t know much about the benefits of blogging but thought it would be a great way to connect with parents and a bit of fun, if nothing else. My students and I thoroughly enjoyed blogging and by early 2009, I began to make global connections with other blogging classes around the world. My first real connection was with Linda Yollis and her class in California. Little did I know I’d hit the jackpot there! Over the years many amazing connections were established and my students and I worked on many global collaborative blogging projects. During my blogging journey, I also spent a few years team teaching with Kelly Jordan. I found it hugely beneficial to have one class blog, two teachers and many students working and blogging together. Raising $20,000 for a Ugandan school through a global project I created with other educators. Having my grade two students asked to contribute regular content on our local radio station blog. Seeing individual students transform in and out of the classroom through having their own blog. Creating strong lines of communication with parents and even seeing parents make their own global connections and friendships. Meeting many blogging buddies at ISTE in San Diego and presenting with Linda Yollis after meeting her face-to-face for the first time. 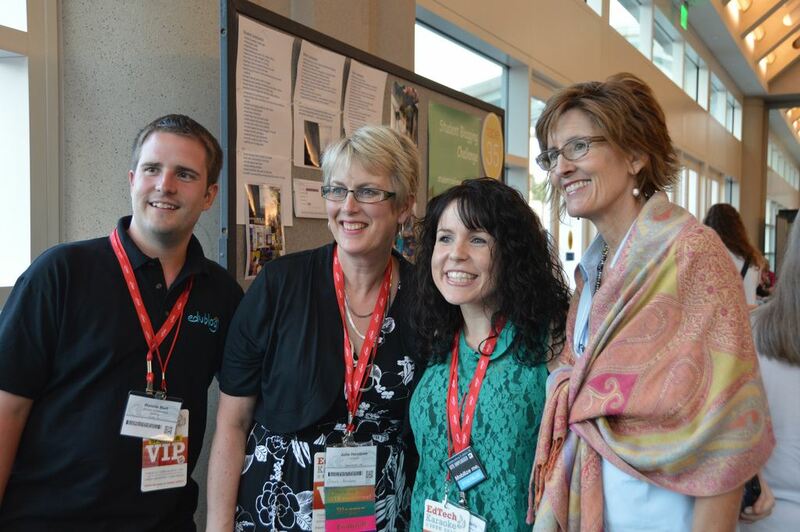 Blogging Buddies at ISTE! Ronnie Burt, Julie Hembree, Kathleen Morris, Linda Yollis. I could go on. These sorts of experiences stemmed from a simple decision to sign up for Global2 and give blogging a try. Nearly a decade later I still host my professional blog on the Global2 network. I write about educational blogging (unsurprisingly! ), global collaboration, digital citizenship and technology integration. 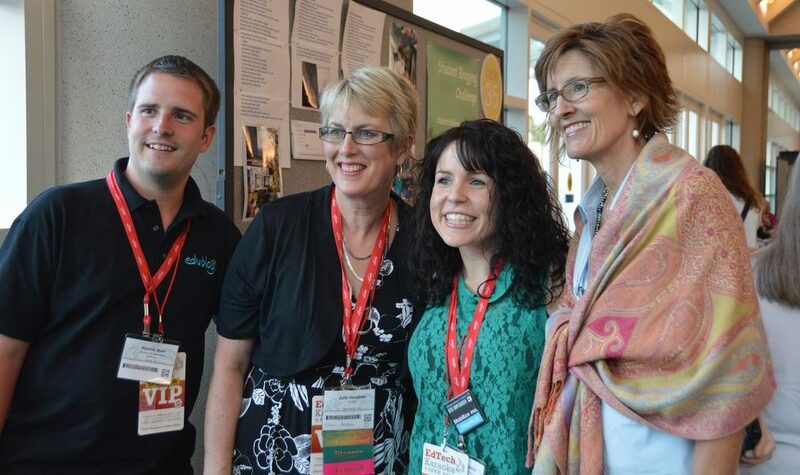 There are many other educators in Victoria doing fantastic things with their Global2 blogs. Let’s take a look at a few examples. There are thousands of educators, students and administrators using the Global2 network to create blogs, websites and portfolios. We’ve showcased just ten and encourage you to share any other Global2 blogs you’ve come across in the comment section. This Catholic school in Melbourne has a fantastic blog which is unique in many respects. They began by only having teachers contribute to the blog before year 5 and 6 students became authors. They now have students from year 1 to year 6 as regular contributors. The overall management of the blog has also recently shifted from teachers to an elected ‘Student Action Team’. They are in charge of the rosters and we have seen a reversal of roles at our school where it is these students who approach others students, the teachers and even the principal about making sure they fulfil their blogging obligations. Positions last a term, so soon there will be an online election for a new Action Team and students will be allocated votes according to how many posts they have contributed. This gradual release of responsibility is a fantastic way to empower students and overcome the obstacle of time that many teachers face. Frank has found an enormous amount of learning stems from the blogging program. Our blog is an important tool for our students to collaborate, contribute, connect, create, communicate and critique (6 Cs). But, there’s an equal amount of mathematical, entrepreneurial, interpersonal learning behind the scenes with managing the blog. Check out some of their terrific ‘Blog Shows’ like Around the Yard, Oliver’s Australian Adventures and Junior Scientist. Presenting the menu of shows as a Google Slide presentation on a page is another excellent idea. Other highlights on this blog include the library of eBooks created by students and the collection of student made games. Prepare to be blown away by some of the media and digital technology work being done at Berwick Lodge Primary School. They have their own weekly television series called LODGERS which is extremely professional and nothing short of inspiring. Check it out! If that’s not enough, Berwick Lodge have their own weekly radio show, a weekly live streaming of a STEM class on YouTube, and an impressive showcase of work in the areas of robotics, coding, 3D printing and more. Wow! This blog is truly a credit to teacher, Rob Kelly, who also has classroom teachers participate in all the lessons with their students as a form of ongoing professional development. Teacher, Roslyn Green created this blog in 2011 when she was in the process of learning German herself. It’s always so powerful when teachers show that they too are learners! In the last few years, Nathaniel Smith and Jana Kühn have also become authors. The blog houses study materials for teachers and students including links, ideas, quizzes, videos, worksheets, and lots of information and strategies that may be useful for German language learners. A blog that is updated regularly is particularly useful to families. This blog for students in their first year of school is an credit to the Prep team at Princes Hill Primary School. It offers lots of updates and reminders on administrative matters while showcasing student learning. It’s safe to say, parents would love this virtual window into the classroom. Traditionally a blog would contain simply text and images. The nature of blogs is evolving and the possibilities are endless. This Global2 blog is used to broadcast a podcast. The Encore podcast is run by grade 5/6 students at Fyans Park Primary School who interview people from the school community on a weekly basis. They use a tool called Spreaker to embed the podcast into the blog. Members of the school community are encouraged to get involved via the comment section of this blog as well. This comprehensive primary school blog is used as an online homework platform for instrumental music students. It uses pages to divide resources into grade levels and subject areas. Students can find: sheet music, chords, lyrics, videos, audio files and more. Kororoit Creek Primary School also has some other great blogs in different specialist departments such as French, Art and Physical Education. This is a blog run by the grade 5/6 team at Bell Primary School. A team blog can be a great way to connect classes and present a united approach to the curriculum and school programs. This blog showcases student work as well as providing recounts, housekeeping information for families, and homework resources. Some other areas of Bell Primary School use blogs including the Prep team (kindergarten) and the Music/Visual Arts Department. This is a comprehensive school library website. The home page is used to showcase new additions to the library while pages are used to house useful resources by year level according to subjects being studied. It is clear that the school library staff work closely with students and teachers to support everyone’s needs. This is a very practical ICT specialist class blog from St Robert’s Primary School. There are pages for each year level that link to lesson resources. The blog also provides relevant information on digital citizenship and other topics. There are links to other school blogs and wikis that showcase student work. Overall, this is a useful and well organized hub for the ICT subject area. The Learning and Teaching Branch of the Victorian Department of Education and Training uses this blog to share digital learning news. This site is a hub for educators and schools looking for professional development news and resource collections. Educators across the state are encouraged to subscribe to blog updates. How did you get started with blogging? We’d love to hear your own story and invite you to leave a comment. We also encourage you to comment if you know any other standout blogs on the Global2 network, or any platform! If you’re feeling inspired and you’re wondering if a whole network of blogs could work well for your school, district or even state, our CampusPress team can help. You’re welcome to get in touch at any time and chat about possibilities. Global2 has produced many stories over the last decade or so, and the future is bright. What will your blogging story be? Wow, amazing story! I have tried blogging, but only failed. You inspired me to try again! Thanks for sharing. I recently just started blogging. I did this because some kids in my class don’t all have their science fairs picked yet. That’s such a great idea. What an inspiration. I hope you continue to enjoy blogging!